Limestone rocks, a hiking trail, beautiful scenery and lush backdrops compose Yana Rocks. These rocks lie close to the village of Yana in the Uttara Kannada district of Karnataka. 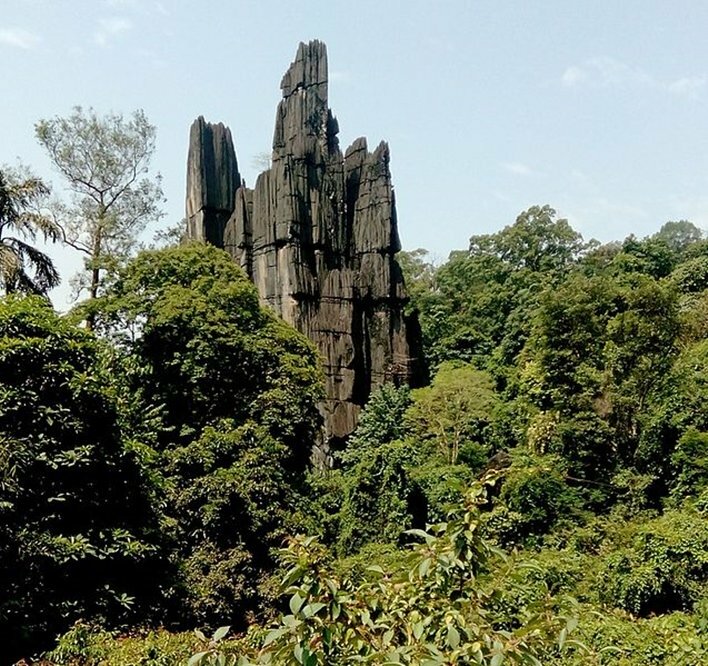 They are home to an epic trail of limestone formations and black karst structures that make for the perfect weekend getaway from the neighboring cities of Karnataka. There is so much to do and explore in Yana rocks that one could easily spend 2 days of hiking and sight-seeing. Black limestone rock formations form the backdrop of this area. There are two main hillocks, namely- the Mohini Shikhara at 90 metres and the Bhairaveshwara Shikhara at an elevation of 120 metres. There is a mythical story associated with Yana Rocks. Legend has it that Bhasmasura, the demon king, was granted a boon by Lord Shiva himself that anything he would place his hand on would turn into ashes or bhasma. He thought of testing this on Lord Shiva’s head. The Lord escaped and reached out to Lord Vishnu to help him out. The former turned himself into a beautiful woman, Mohini whose beauty enticed Bhasmasura. She asked him to take up a dance challenge while she posed with her hand on her head. As Bhasmasura copied her, he turned himself into ashes. Thus, Yana Rocks are black in color. The taller one is the Bhairaveshwara Shikhara or Shiva’s Hill while the smaller one is the Mohini Shikhara or Mohini’s Hill with an idol of Goddess Parvati. The caves of Yana are worth a visit. They share a close proximity to the Sahyadri Range and are about 3 meters in depth. The caves contain a special element – a self-made Shiv Ling that is present in the Gangodbhava Temple. Yana caves can be accessed during the trek and showcase beautiful hills and waterfalls from the access points. This is a huge festival in South India, and more so in Yana. The temples are dedicated to Lord Shiva and tourists flock here in huge numbers to pay respect to the Lord and seek his blessings. Sirsi is barely 50 odd kilometers from Yana. It is known for its tourist attractions such as Sahasralinga, Unchalli Falls, Shivagange Falls, Benne Hole Falls and Gudavi Bird Sanctuary besides the famous temples of Marikamba, Banavasi and Shri Subrahmanya Temple. Mirjan Fort is the spot where several battles were lost and won earlier in Karnataka. It lies towards the west coast of the Uttara Kannada district of Karnataka. The fort is known for its architectural beauty. You must not miss out the watchtower, the deep well and prayer hall amidst the ruins. These 30 feet falls offer spectacular views of the bamboo forests and mangroves they are nestled in. The path leading to it is very narrow and special care must be taken not to damage the natural surroundings. If you are lucky, you will be able to spot quite a few wild animals. The hiking trail along the rocks is marked quite well. Thus, there is no need to really hire a guide unless you are very comfortable doing so. Trekking routes begin with a well-paved trail and staircase leading above. It later opens out to crests and troughs of the plantation and natural terrain. 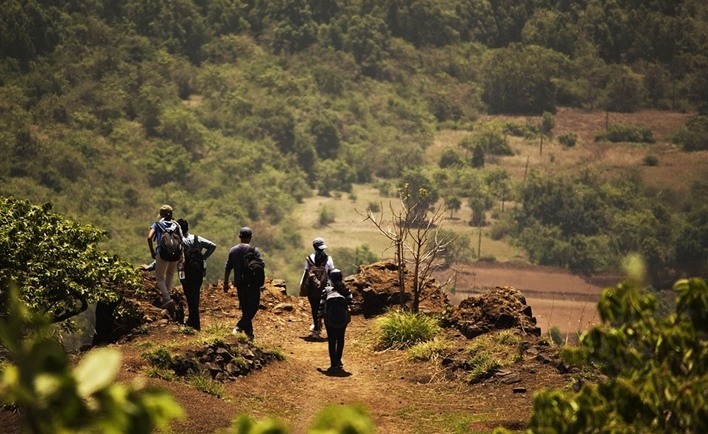 You could start the trek from any one of the two sides – Sirsi or Kumta. The route from Sirsi is relatively easy as compared to the one from Kumta. The hike takes at least half a day or about 6 hours or so in total. Gear up with some snacks, water, and sunscreen and get ready to brave the walk. You will encounter different species of snakes and reptiles. Be mindful of leeches. Closer to the monsoon season, their numbers seem to multiply. Carry a bag of salt with you to apply on leech-struck patches of your skin to wean them off. It is advisable to avoid the monsoon months and head there soon after the rain spree is over. The closest airport to Yana Hills is Mangalore Airport at 262 kilometers. The second closest is Kempegowda International Airport of Bangalore at 463 kilometers. To travel by rail, board the train from Hubli Railway Station or from Bangalore to reach Kumta Station. From there, take a bus or taxi to reach the village of Yana. It lies 55 kilometers from Sirsi and 30 kilometers if you’re coming from Kumta. You could take the local bus from Bangalore or hop onto one that plies between Kumta and Yana. They might not be very frequent, so make sure you check the timings in advance. In case you’re heading from Dharwad, it lies 182 kilometers away.